Got Counting Money Worksheets? Well you have them now. We are just starting this page and will be adding worksheets to help kids learn about money on a regular basis. So Be sure to check back often. 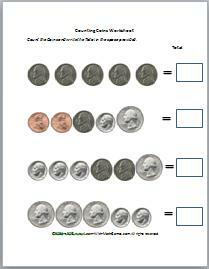 Count the Coins: Kids will get practice learning to count money with this worksheet. They will be given a picture of a group of coins and will then add them up to calculate the total amount. Toy Shop Money Game: Here's a great online game for young learners where they use coins and bills to pay for various toys. If you like the money worksheets, your students will probably also get a lot of fun learning from money games. Here's an example of a money counting game focusing on combinations of coins that equal the same value. For more printable money games like this you can go to the main Money Games For Kids page. Got Any Great Classroom Math Games? Share it! Here's a great place to help others experience the fun math activity that has worked well for you. If you have a favorite math activity, or a great teaching tip about any math topic, I'd love to hear from you!